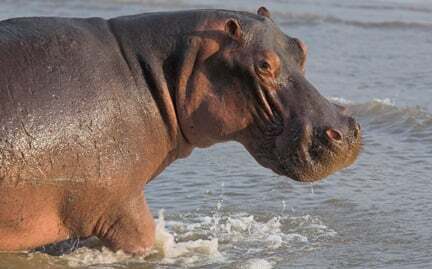 The hippopotamus, also known as the “river horse,” lives along the rivers and lakes throughout sub-Saharan Africa. Weighing up to 8,000 pounds, the hippo is the heaviest land animal after the elephant. The eyes and ears of a hippopotamus are on top of its head, so it can keep watch for enemies—mainly crocodiles—while lying low in the water. These giants are currently at risk from habitat loss.